Uniforms worn by Navy Nurses during the late 1920's and 1930's. From left to right: white outdoor uniform, blue outdoor uniform, hospital dress, cape.
. After the end of war, the personnel strength of the Navy Nurse Corps was reduced fast. Most of the Reserve Nurses went back to civilian life. About 500 nurses remained active in the corps. This number was kept for the next ten years. The financial shortage of the government caused by the Great Depression during the 1930’s led to further reductions. In 1935 the lowest census level with 332 nurses was reached. The situation changed after the Congress passed the “Naval Reserve Act” in 1938. This public law was a reaction to the threatening war in Europe. It should enable the U.S. Navy to get prepared for a possible emergency. The “Naval Reserve Act” established a new Naval Reserve as component part of the U.S. Navy. It authorized the appointment of female registered nurses. Immediately after the outbreak of war in Europe the Navy started with the mobilization of the Reserve Corps. The Red Cross provided the Reserve Nurses for the Navy Nurse Corps. Reserve Nurses had to be ready for active duty within 24 hours. A year later, in the end of 1940, the Navy Nurse Corps held nearly 1000 Reserve Nurses on inactive status and about 500 active Navy Nurses. Just before the United States joined the war in December 1941, the Navy Nurse Corps consisted of nearly 800 active Navy Nurses and Reserve Nurses. Additionally, the corps obtained over 950 Reserve Nurses on inactive status. Nurses were appointed to several Navy hospitals and Navy stations inside the USA and overseas (including a new duty station in Kodiak, Alaska since June 1941). Additionally, Navy Nurses served on Navy hospital and transport ships. During the 1920's, Navy Nurses received their first appointments to permanent duty aboard a Navy ship. 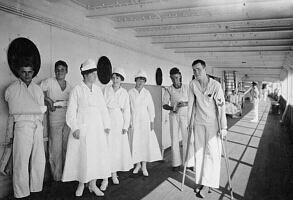 The picture on the right shows Navy Nurses with their patients, aboard the USS Relief (AH-1) in the spring of 1921. ..
Ward scene in the U.S. Naval Hospital, Washington, D.C. during the 1930s. It shows a Navy doctor, a Navy Nurse and a hospital corpsman attending to a patient. 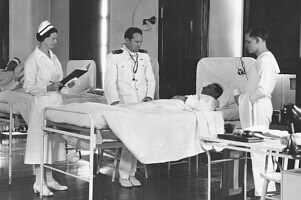 .. Navy Nurses were responsible for the instruction and supervising of hospital corpsmen, as before. In overseas aeras, they continued to train local nurses. They cared for the Naval personnel at home and outside the United States. Additionally, they helped in a number of civil disasters. Navy Nurses assisted to evacuate American dependents from war-torn China in 1938. Four nurses of the corps were entitled to wear the China ribbon for their extraordinary performance. Starting in the 1920s, the nurses were actively encouraged to apply for continuous education. For example, they could receive specialized training in dietetics, laboratory, techniques, anesthesia, physiotherapy, tuberculosis nursing and instructing. This was a welcome professional gain for the Medical Department of the U.S. Navy.
. "Neither Fish nor Fowl"
. Although the Navy Nurses had to adhere to the rules and regulations as they applied to Navy officers, they did not receive the same pay nor the formal rank or relative rank of officers. Therefore, most of them considered their status as “neither fish nor fowl”. Attempts to entitle the Navy Nurse Corps to relative rank of commissioned officers failed several times. Only the Army Nurse Corps received this privilege in 1920. The Navy Nurse Corps had to wait until 1942 to achieve formal officer status. However, in 1923, Navy Nurses were ordered to wear stripes on their uniforms that designated the various grades corresponding to the Naval officer grades of ensign to lieutenant commander. The Nurse Corps obtained the grades of Nurse, Chief Nurse, Assistant Superintendent (newly introduced) and Superintendent. The photograph on the right, taken during the early 1920's, shows J. Beatrice Bowman engaged in office work. The two stripes on her ward cap indicate that she holds the grade of Assistant Superintendent. .. 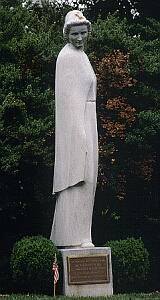 The late 1930s saw the unveiling of a nurse statue at Arlington National Cemetery. The statue was dedicated to the memory of nurses of the Army and Navy Nurse Corps who gave their lives in the service for their country. Sculpted by Francis Rich, its bronze plaque states "This monument was erected in 1938 and rededicated in 1971 to commemorate devoted service to country and humanity by Army, Navy, and Air Force Nurses". In November 1922, Mrs. Higbee, 2nd Superintendent of the Navy Nurse Corps was honorably discharged at her own request (she desired a different occupation). Three years after she died in 1941, an US Destroyer was named for her – it was the first combatant ship to be named after a woman of the service. .. 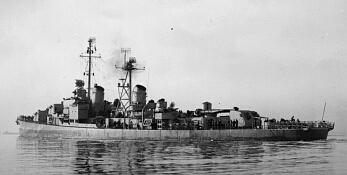 The picture shows the US Destroyer Higbee, DD 806, off Boston, March 1945. .. 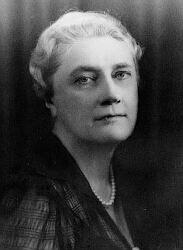 In December 1922, J. Beatrice Bowman became 3rd Superintendent of the NNC. She was one of the Sacred Twenty. She retired in January 1935 from active duty after more than 25 years of serving, from it 12 years as Superintendent of the Navy Nurse Corps. The era of the Sacred Twenty came to an end with Ms. Bowman. She was the last of the Sacred Twenty to be released from active duty. 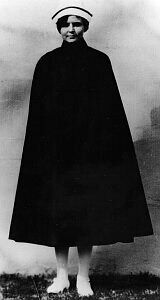 Josephine Beatrice Bowman, (NC) USN. She was the 3rd Superintendent of the Navy Nurse Corps, from 1 December 1922 to 1 January 1935. Appointed as 4th Superintendent was former Assistant Superintendent Myn Hoffman (then over 50 years old). She served efficiently while in charge and carried out further advancements within the Naval Nurse Corps during a period of medical progress following the Depression, and retired in October 1938. 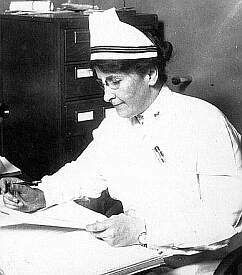 Myn M Hoffman, fourth Superintendent of the Navy Nurse Corps, 1 January 1935 to 1 October 1938. ..
.. The 5th Superintendent became Chief Nurse Sue S. Dauser in January 1939. 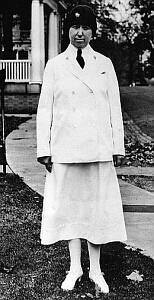 During WWI, Ms. Dauser was appointed as chief nurse to the Naval Base Hospital #3 in Leith, Scotland. Later she had served in Guam, Canacao and on the hospital ship USS Relief. 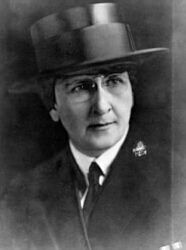 When the Navy Nurse Corps received commissioned ranks, Ms. Dauser was appointed to be the first Superintendent to hold the rank of Captain. 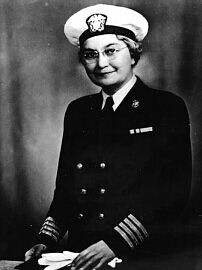 She had the difficult task to lead the Navy Nurse Corps successfully through the time of the Second World War. WW II portrait photograph of Captain Sue S. Dauser, (NC) USN, 5th Superintendent of the Navy Nurse Corps from 30 January 1939 to 1 April 1946.